The latest offering from the lock specialists Noble Locks comes the Combination Wedge Lock TZ07T featuring their Wedge Lock Keyless Solution. The latest offering from the lock specialists Noble Locks comes the Combination Wedge Lock TZ07T featuring their Wedge Lock Keyless Solution. With 10,000 possible combinations, each lock is personal to the user giving the convenience of not losing the key or even leaving at home or the office. 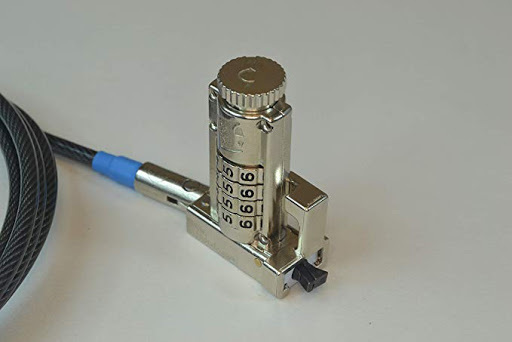 A simple mechanism allows the user to change their the combination to their own preferable 4 digit code therefore personalising their experience. The Noble TZ07T Includes a peripharable trap therefore you are able to secure mouse and USB cables. 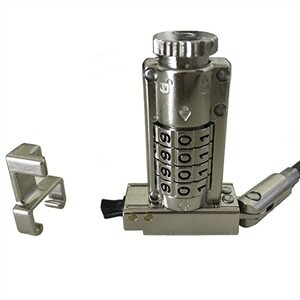 Compulocks DELL Wedge Security Cable Lock - WDG08 The Wedge Tablet Lock is a low profile cable security lock that specially accommodates the new WEDGE slot enables your customers to secure these slim devices which no longer support the old standard Kensington (T-bar) lock.